Back in March I was shown how to make this tank by Graham, I think it looks rather cool so tanks Graham . . . I mean thanks Graham. 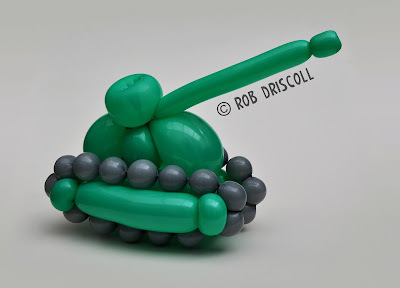 It is made from 5 balloons, a 350 makes up the body and turret of the tank with a 160 as the gun, I then add a 260 for the rest of the body and finally another 2 grey 260s for the tracks.